URUMQI, China (CNN) -- Han Chinese protesters were out in the streets, not far from our hotel near the People's Square, on Tuesday. A lot of the Han Chinese own shops in the area and there are some hospitals in the vicinity. 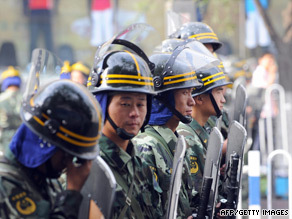 Chinese troops stand guard in Urumqi, July 8, 2009. When we saw the protesters marching in the streets, we simply followed them. It was, in a way, a little dicey, because obviously there was raw emotion among them. There is also raw emotion on the part of the Uyghurs. So, we had to keep in mind safety and security. In fact, while we were shooting pictures for our report, some of the protesters turned to us and told us, "stop shooting, stop shooting." We saw hundreds of Han Chinese holding sticks and pipes basically calling for severe punishment of the Uyghurs, who they say committed serious crimes during Sunday's deadly rioting. When we got close to the Uyghur-populated area, we were stopped by the police and told to get in their jeeps. They said it was for our own safety. They probably were right. We may have been pushing our luck and could have gotten caught in potential confrontations and clashes. Before that, we stopped and talked with a doctor in front of a small traditional Chinese hospital close to the People's Square. The doctor said the Han Chinese are trying to defend themselves. He was very angry about the violence reported on Sunday. He said that they are fed up with what they saw, they felt that it was unspeakable that young people, old people and women were beaten up, helpless people who just happened to be in the wrong place. So there is this very visceral anger among many Han Chinese. During the march on Tuesday, there were different groups, kind of in waves, marching through the streets. A few times they converged. I would say it was pretty spontaneous. Pent up emotions, boiling over. Ethnic tensions run deep in this region, with minority groups such as the Uyghur Muslims complaining they are subjected to discrimination by the majority Han, despite government guarantees of equal rights. The Uyghurs say they've been victimized and that many of those killed in the recent violence were Uyghurs. Local officials on Tuesday organized a press conference and they called in three ethnic Uyghur religious leaders who condemned Sunday's violence. The vice chairman of the Muslim Association said what happened on Sunday was against the spirit of the Quran, the holy book of Islam, and of Uyghur tradition and religion. Right now (Wednesday morning), we are driving around Urumqi in a taxi and we see fairly light traffic. On our way we have seen anti-riot police taking positions in major intersections. This is a build-up from yesterday -- the arrival of reinforcements of People's Armed Police. I talked with a local official Wednesday morning. She told me that it is very important that they show they are in charge and that they are taking measures to ensure the safety of residents. The local official told me this morning that, in a way, the protests on the part of the Han Chinese were probably unavoidable because people were looking to blow off steam, especially since the Internet has been down. The Internet, in other circumstances, has played a role in allowing people to release pent-up anger. But without the Internet, many of the Chinese, especially the young, have bottled-up rage stoked by the images of violence they've seen in the Chinese media. The local authorities are urging residents to show restraint. Wednesday morning, I saw a few people holding sticks but there were no signs of organized protests. I didn't see the kind of violence or antagonism I saw on Tuesday, but I think it is still a very fluid situation.